First published in 1787, and reputed to be the first directory for Glasgow, this 1868 reprint is republished here on fully-searchable CD-Rom. 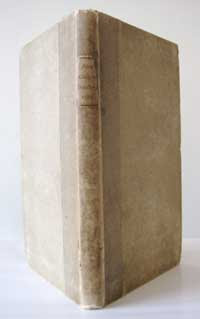 The book contains 114 printed pages and includes several sections not present in the original issue as indicated by the full title of this edition: Reprint of Jones's Directory; or, Useful Pocket Companion for the Year 1787. With an Introduction, and Notes of Old Glasgow Celebrities, by the 'Rambling Reporter'. Originally compiled by the coffee room keeper, Nathaniel Jones, as a list of subscribers to his coffee room, his members persuaded him to go beyond his original aim and include as many manufacturers, merchants and companies as her could collect and thus Glasgow's first directory came into being. For more on the directory, and how to buy it, visit the following link: Directory of Glasgow. A BBC Archives Collection concerning the Suffragettes has been placed online for the first time. "This week, a BBC online archive collection of suffragette voices has become available to the public for the first time. Ranging from Dame Ethel Smyth describing her arrest for throwing a stone, to Mary Richardson’s account of being force-fed in Holloway to the photographer Arthur Barrett explaining how he used a hidden camera in his top hat to snap the Pankhurst’s in court, the collection brings the stories of the suffragettes vividly to life. Jenni talks to Kate Wheeler, the producer who oversaw the creation of the collection, about some of its treasures, including four interviews from past Woman's Hour programmes." No idea if there are any Scottish contributions in there, but if you have Scottish suffragette ancestors, you should approach the Glasgow Women's Library at www.womenslibrary.org.uk for help, as they have a great deal of useful material. The centre is planning to move to the Mitchell Library in due course in 2010, and is currently raising money through its Women on the Shelf campaign, where people can sponsor a shelf that they can dedicate to a woman of their choice, with all contributions building towards a living, working tribute to the great women of Scotland. The Galloway Homecoming Exhibition is running until December 31st at Stranraer Museum. The exhibition tells the stories of Galloway’s emigrants and explores connections from Galloway and the New York Public Library to the most advanced cotton mills in Manchester, England during the Industrial Revolution. Galloway’s émigré families not only paved the way to new lands but made contributions both at home and away, many of which still have a global and enduring effect today. Families featured in the exhibition include the Cochrans and Carnochans, the Lenox family, the Douglases and the Murrays. The visitor to Skara Brae on St Andrew's Day weekend can visit, free of charge, the best preserved Neolithic settlement in Northern Europe, spread out beside the Bay of Skaill, Orkney. Standing alone, it comprises eight ancient dwellings with interlinked passages. However, with interactive computer technology, it becomes more. The recreation of house number seven and a virtual walk-through plugs the gaps in our imagination, enabling us to connect with the people who lived there five thousand years ago. At Stenness, the chambered cairn of Maeshowe will also open for free, giving visitors the chance to travel back to the heart of Neolithic Scotland and the fascinating beliefs of its earliest settlers. On St Andrew's Day, Scotland's most cherished Castle, Edinburgh Castle – visited by over one million people last year – will be free to the public. Urquhart Castle, overlooking Loch Ness, is also participating in the St Andrew's Day on Saturday 28th and Sunday 29th, giving the public free access to two of Scotland's most iconic and photographed buildings. One of the undoubted jewels in the St Andrew's Day crown will be free admission to the refurbished Robert Burns Birthplace Cottage in Alloway. The Ayrshire poet is seen as central to the cultural identity of Scotland, and the Year of Homecoming has celebrated the 250th anniversary of his birth. Improved interpretation facilities and a new film will reintroduce visitors to an ordinary Scot with an extraordinary talent for tapping into the soul of humanity. The country's biggest and most comprehensive family history event returns, and tickets are on-sale in just a few days time! With celebrities from the TV show, an extensive workshop programme, one-to-one advice, and around 200 exhibitors, all perfectly placed to help you with your research, it's no wonder that Who Do You Think You Are? LIVE is firmly placed as a favourite date in the family history calendar. And as if that weren't enough, family history enthusiast Tony Robinson will be making a special guest appearance on Friday 26th February courtesy of title sponsors Ancestry.co.uk - don't miss your opportunity to see one of Britain's favourite personalities give his unique and inimitable take on history! THE PHOTOGRAPHY GALLERY - NEW FOR 2010! New for this year, there will be a fantastic Photography Gallery. Whether you need your photos dated, identified, preserved, digitised or restored, why not bring them along to the event? With a variety of experts all focusing on photography, and a brilliant new competition to be announced in the near future, make this the year to preserve your memories. BRAND NEW WEBSITE AND EXCLUSIVE OFFERS! As a newsletter subscriber, we wanted you to be the first to know about our brand new website which has just been launched. Visit http://www.whodoyouthinkyouarelive.co.uk/ for show information and to buy tickets when they go on sale next week. As a valued subscriber, we will also be offering an exclusive early bird ticket offer of 2 tickets for £18 - saving you £26 on the full ticket price. Keep an eye on your inbox for news of tickets going on sale next week! *£2 transaction fee applies. Offer calculated on on-door standard entry tickets priced at £22 each. This is not a BBC event. So - is WDYTYA? Live worth visiting? I've been twice, and have to admit that it is a hell of way to go for a genealogy event if you live in Scotland. However, it is also a fantastic event, and despite the hassle and the cost, is worth visiting at least once if you are a keen family historian and looking for some useful advice, tips and specialist genealogical resources. I have blogged about the last two events at Who Do You Think You Are? LIVE - report (2008) and Who Do You Think You Are? Live 2009 report. Hopefully this year will be as good as the last two - but please, let's not have another kilted 'Scottish Saturday' tagged on at the last minute in a desperate bid to try and get the Scottish vote! That definitely felt as if somebody had at the last minute cottoned onto the fact that this year was Homecoming Scotland - mind you, I'd be up for an English Friday with some good Morris dancing, an Irish Saturday for a cribeen eating contest, and a Welsh Sunday for a big songfest!! If you are looking for a genealogical stocking filler for Christmas, a new book to be released in a couple of weeks time could be just the ticket. 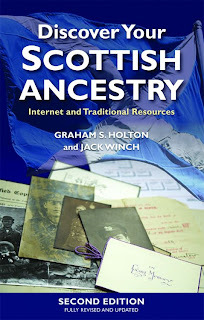 Discover Your Scottish Ancestry: Internet and Traditional Resources is a second revised updated edition of a popular book by Graham Holton and Jack Winch, published by Edinburgh University Press. Whilst I don't know Jack, Graham was one of my tutors during the postgraduate diploma in genealogical studies that I studied at the University of Strathclyde, and he's a man who certainly taught me a thing or two. I'll be going on a much larger voyage of discovery with Discover Your Scottish Ancestry in a forthcoming review for Discover my Past Scotland magazine! In the meantime, priced at £14.99, the book is to be released towards the end of November. From what I've seen so far, it's a definite worthy addition to your bookshelf, with a fairly hefty and useful bibliography included as well as many useful web addresses. St Kilda Centre for Mangurstadh, Lewis? Following an independent feasibility study, funded by Comhairle nan Eilean Siar, Highlands and Islands Enterprise and LEADER, the St Kilda Centre Working Group has announced the recommendations made by Jura Consultants in an independent feasibility. After an intensive assessment process, Mangurstadh in Uig (Isle of Lewis) has been identified as the preferred location by the consultants for the proposed St Kilda Centre. Three possible sites had been shortlisted as potential locations for the Centre; Cleitreval in North Uist, Leverburgh in Harris and Mangurstadh in Uig. Chair of the St Kilda Centre Working Group, Councillor Angus MacCormack commented: "This was a very difficult decision for the consultants to reach. “All three site locations are viable and the potential for development strong in each area. “The proposals were extremely well presented and developed by the community groups. The consultants have now undergone a detailed process which had to make one recommendation from the three submissions." The feasibility study also identified the potential in developing a St Kilda Trail through the Outer Hebrides. The consultant's findings and recommendation will now go to the Council and relevant groups. The Working Group is comprised of representatives from HIE, CNES, PNE, VisitScotland, National Trust for Scotland. Two new books are being transcribed for the Electric Scotland site at www.electricscotland.com. These are Reminiscences of Dollar, Tillicoultry and other Districts adjoining the Ochils with Notes on Progress, Scientific Discovery, and Invention of New Spinning Machinery, during the last Hundred Years, by William Gibson (1883), and More Adventures in Kilt and Khaki: Sketches of the Glasgow Highlanders and others in France by Thomas M. Lyon (1917). In his latest newsletter at www.scotchat.org/showthread.php?t=295 the site's supremo, Alastair McIntyre, has clearly been having a bad week following the installation of Windows 7; on a brighter note, Scottish born Alastair has now become a fully fledged Canadian citizen, following a swearing in ceremony in Windsor - a huge congratulations to Alastair! Keep an eye out for an interview with Alastair in next month's Discover my Past Scotland. If you had a veterinary surgeon in the family in the late 19th C, you might be interested to know that the Original Record website (www.theoriginalrecord.com) has just uploaded an annual register from February 1890 for The Royal College of Veterinary Surgeons, which lists fellows, ordinary members and a list of honorary and foreign associates. BBC4 is tonight showing a documentary entitled The Men Who Built the Liners, as part of the Time Shift series, which focuses on the Clyde Shipyards and the men who worked there, as wellas th stories behind some of the more famous vessels constructed there such as the Queen Mary, the Queen Elizabeth and the QE2. The University of Glasgow Library blog reveals how the producers visited its Archive Services earlier in the year to film some of the records of the Clyde Shipyards held there. The Men Who Built the Liners is on at 9pm, and will be available for a week after on the BBC iPlayer at www.bbc.co.uk/iplayer. Borders based genealogy firm Maxwell Ancestry has finished linking household entries for the parishes of Minto and Roxburgh in the 1841-1861 censuses to online maps, thereby passing the 25% mark for their project to complete such a facility for several counties in the Borders area. To freely consult the census returns in the project, visit www.maxwellancestry.com/census/default.htm, whilst for an update from Graham and Lisa themselves, view their blog entry today at http://scottishgenealogyblog.blogspot.com/2009/10/26-of-our-census-mapping-project-is-now.html. A parish school at Durness had no pupils in it for 19 years in the late 19th C, but retained its headmaster for the duration, he having refused to leave until a change in the law led to his being sacked. A good and classic case of Scottish "oh ye bloody think so?"-ness...! The school is currently being excavated by Glasgow University Archaeological Research Division (GUARD), and local community company Durness Development Group has been involved in researching its history. A new website designed by Learning and Teaching Scotland is now online, designed to help pupils, teachers and parents with Scottish history. Entitled Scotland's History Online, the site is available at www.ltscotland.org.uk/scotlandshistory and offers information on over 200 topics, with links to over a thousand useful online resources. The latest issue of Discover my Past Scotland (Dec 09, issue 13) is now on sale at www.discovermypast.co.uk for just £2.50. This month, John Hannavy looks at the Scots at War, Sue Wilkes searches for the Covenanters, I take a look at discussion forums of particular use for your family history research (with a particular focus on ScotFamTree), Jenny Swanson goes in search of Canadian and American relatives, Katie Howard visits Mull, Wendy Glass meets the fishermen of Arbroath, and there's all the usual features, including expert Q&As, the latest Scottish events, bygone days, Homecoming Happenings, and the latest news and reviews from yours truly. The Gathering Special is also available from the site, and all back issues can also be downloaded - a list of contents for each is available on the site. Oh, and for all you English folk - watch this space...! Details included in the index to the Poor Law Records comprise names, place of birth, age or date of birth, address, other family members, description of disablement, date of death, and there's more information on the images themselves, including occupation, benefit received. The CD costs £12 + p&p. For more, visit the Borders FHS website at www.bordersfhs.org.uk/BFHSPoorLawVolumes.asp. (With thanks to the SAFHS website). A mysterious carved sarcophagus stone has been found whilst builders were excavating and renovating a property beside the old church in Temple, the Midlothian village named after the Knights Templar, who once held their headquarters in the area. Following on from a post on this blog on the 17th, it is now confirmed that the Mitchell Library's Archives and Special Collections department has new opening hours, at least until December 31st. Due to staff shortages, the archive will unfortunately no longer be open late on Thursdays or on Saturdays (although in certain circumstances, and by prior arrangement only, access to the archives may be agreed on a Saturday). UPDATE 30 OCT 09: Thanks to Alex (Jock Tamson) from the ScotFamTree forum for sharing his response from the Mitchell concerning the new arrangement, which is confirmed as temporary, and which will be resolved when a new post is filled in January - for the full response see the follow on comments from this post. The Business Archives Council of Scotland, in collaboration with the University of Glasgow's Centre for Business History in Scotland, the Ballast Trust and the Institution of Engineers and Shipbuilders in Scotland are pleased to present this one-day conference on Scottish engineering. The conference will take place on Friday 30 October 2009 at the Clydeport Building, Robertson Street, Glasgow between 1000 and 1600. Cost: £25 for BACS / IESIS members, £30 for non-members. The non-members fee includes a one-year membership of the BACS. A buffet lunch is included. A small number of free places for students and the unwaged are available on a first-come basis. Despite the recent vandalism a fortnight ago against the new Highland Archive and Registration Service premises at the Bught in Inverness (see Highland Archive Centre in Inverness vandalised), the new £10.5 million centre was opened today on schedule. Mealaibh ur naidheachd, agus gur math a thèid leibh!! 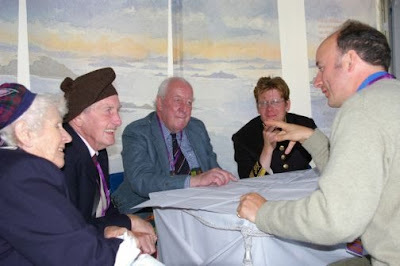 For more on what the centre can offer, visit the site's website at www.highland.gov.uk/leisureandtourism/what-to-see/archives/highlandcouncilarchives, whilst for Highland Council's Genealogy Service, visit www.highland.gov.uk/leisureandtourism/what-to-see/familyhistory. The next Highland Council archives centre to open as part of the institution's 'Hubs and Spokes' strategy will be the Skye and Lochalsh Archive Centre (Ionad Tasglainn an Eilean Sgitheanach is Loch Ailse) later this year at the Elgin Hostel in Portree, which will include a public searchroom, exhibition space, and a controlled repository which will accommodate the current collections alongside relevant records relating to Skye and Lochalsh which are at present held in Inverness. The design represents 'the combined heritage of the Black Watch, one of the oldest Scottish Military tartans, with an overcheck of the red, white and blue of their brothers-in-arms, the US Military'. I have recived some more information on the proposed online Master's course in Highlands and Islands History from the UHI (see UHI Masters Degree in Highlands and Islands history). Further details will be added in due course on the UHI website as the programme develops, and an additional and more informal way of keeping in touch with the Centre for History's developments is its Facebook Group at www.facebook.com - type in 'Centre for History' to find them. Today's Scotsman newspaper has a fascinating story about a potential candidate for the chieftainship of the Glencoe branch of the MacDonald clan. New Zealander Colin MacDonald is hoping to have his claim recognised, as a descendant of Alasdair Macdonald (or MacIain) of Glencoe, one of the victims of the massacre in the glen in 1692. Before he can be granted the title, however, there could be a fly in the ointment - another potentially superior claim has appeared which has to first be ruled out. MacIain's 3 x great grandson Ewen Macdonald of Glencoe (1788-1840) is claimed by Hugh Peskett, the Scottish editor of Burke's Peerage, to have had a romantic liaison with Bunnoo, the daughter of an Indian maharajah, whilst working as a surgeon in India. They had a daughter called Ellen in Calcutta in 1830, and Peskett claims that they married later by cohabitation and repute in Scotland, thereby legitimising Ellen under Scottish law. He has also discovered that a tailzie was created by Ewan which allowed for Ellen to succeed her father as chief, if her husband changed his name to Macdonald of Glencoe. Her husband, Archibald Burns, duly added Macdonald to his name after they married in Sri Lanka in 1888. The last person to be recognised as MacDonald of Glencoe was one of their seven children, Major Duncan Macdonald. The hunt is now on to see if he had any surviving children - if not, Colin MacDonald is in with a strong chance of gaining the title. We would like to find owners of derelict, historic homes for a new BBC television series, and follow them as they save these architectural gems from ruin and restore them into wonderful 21st century homes, while turning detective to unravel the properties’ extraordinary lives. What secrets do these houses hold? What events happened? Who lived there over generations? How was the property used? At the end of it all, we’ll see an important historical property saved from dereliction and brought back to life to become a home once more. If you are renovating a property and want to discover more about its structural and social history, please call 020 8222 4996 or e-mail homes@endemoluk.com. Do you have an interesting story to tell about your family history? Has the research you’ve undertaken led you on an interesting quest? Has family history changed the way you think and feel about your ancestors? If so, top author Cherry Gilchrist would love to hear from you! Her new book, Growing Your Family Tree, will be about the experience and meaning of family history, and will include many individual stories and anecdotes. You can find more about Cherry at www.cherrygilchrist.co.uk. Her latest book, Your Life, Your Story: Writing your Life Story for Family and Friends, is published next February by Piatkus. She is also a keen family historian, a member of the Powys and the Montgomeryshire Family History Societies, and has been researching her mother’s family tree for about five years now. If you are interested please contact Cherry for a questionnaire about your experiences in family history cherry.gilchrist@btinternet.com. An innovative new website is bringing together important records from two of Scotland’s most comprehensive historic archives. With its place-based search facility, users can create detailed interactive maps using global browsing technology. ScotlandsPlaces (www.scotlandsplaces.gov.uk) will be launched tonight (Thursday, October 22) in Inverness by Culture Minister Mike Russell. A joint partnership between the Royal Commission on the Ancient and Historical Monuments of Scotland (RCAHMS) and the National Archives of Scotland (NAS), it uses geo-mapping software developed by the University of Edinburgh. Website users can enter a Scottish place name, county or parish to start their search before drilling down through a selection of map layers, including Ordnance Survey maps, to refine their search area. Once located, areas can be plotted on a geobrowser (such as Google Earth) with the relevant archive information pinpointed on the map. By clicking on each point, details of the archive links appear below the map search area. NAS information includes plans, official land ownership documents, medical officer of health reports and tax rolls – which in turn can be studied in fine detail – while RCAHMS information includes place descriptions, photographs, plans and drawings of buildings and landmarks, and associated materials and archaeological information. The setup of the ScotlandsPlaces website means that additional, place-related information can be easily included as more partners come onboard. “This innovative website draws on a wealth of information from two of Scotland’s national collections, showcasing the benefits of our public bodies working in close partnership. RCAHMS education & outreach manager, Rebecca Bailey said: “This is a free public resource that will appeal to anyone with an interest in Scotland’s geography and history or in Scottish ancestry. No matter where in the world you are, this website will allow you to locate any place in Scotland and immediately view what additional archive information exists. Importantly, ScotlandsPlaces draws on live data so that as new information is added to the digitised collections of either RCAHMS or the NAS, it will be accessible via the website. 'Did Slavery Make Scotland Great?' - that's the talk being delivered by University of Edinburgh historian Tom Devine this coming Saturday at the Inverness based Scotland's Global Impact Conference. There's coverage of the First Minister's visit to the ScotlandsPeople Centre last week to launch the Roman Catholic records collection at www.youtube.com/watch?v=UAPLWxXLZZk. Also featured is Cardinal Keith O’ Brien, head of the Scottish Catholic Church, and George MacKenzie, Keeper of the Records of Scotland. A major new resource is now available online in the form of the ScotlandsPlaces website, a partnership site created by the National Archives of Scotland, the Royal Commission for the Ancient and Historical Records for Scotland, and the GIS department at the University of Edinburgh, with assistance from the Scottish Government. In short, ScotlandsPlaces is the geographical equivalent of ScotlandsPeople, and is currently in beta testing form. Manuscript records and printed books from millions of pages in government and private records, including tax rolls, owners of land and heritages, and the annual reports of county Medical Officers of Health. Amongst the holdings are the 1797 Farm Horse tax returns for the country, the 1872-3 Royal Commission on the Owners of Lands and Heritages, 1891 Medical Officer of Health reports, and Hay Shennan, Boundaries of Counties and Parishes of Scotland 1892. Believe me, you should brace yourself for a serious amount of fun...! The site can be accessed at www.scotlandsplaces.gov.uk. RCAHMS and the National Archives of Scotland are proud to launch www.scotlandsplaces.gov.uk as part of the Scotland's Global Impact Conference taking place at Eden Court Theatre in Inverness this week. The website will be officially launched by Culture Minister Michael Russell MSP this evening at Bishop's Palace Chapel. RCAHMS Head of Education and Outreach, Rebecca Bailey said, "As an educational resource it will add immense scope to local history projects or research into Scotland's past. It will also have great appeal for those people trying to unlock their own histories or the stories of their communities." Keeper of the Records of Scotland, George Mackenzie added, "We're delighted to be launching this website in Homecoming year because it will be of interest to Scots abroad as well as at home." To celebrate the launch, visitors to Eden Court on 22-24 October can drop into the ScotlandsPlaces research clinic in the Bishops Palace Chapel, to try out the new website for themselves. Well done to all concerned, and a huge thanks. The Ulster Museum reopens tomorrow morning at 11.30am following a three year long £17 million refurbishment, exactly 80 years after it was first opened in 1929. Old favourites including Takabuti, Peter the Polar Bear, the Chambers Car and the Edmontosaurus dinosaur skeleton will be back on display, as well as the first ever reconstruction of the Giant Deer to be displayed on the island of Ireland, in the new sleek state of the art centre at Botanical Gardens in south Belfast. The centre will be open tomorrow until 10.00pm, and entry is free. A great welcome back to an old friend! Jock Tamson at the new ScotFamTree blog has started a series of interesting posts on the early history of Glasgow's banks, as extracted from "The Glasgow Anecdote" (1912) by D.Malloch. A good story for Trafalgar Day today - the only surviving union jack from the Battle of Trafalgar, flown from one of Nelson's ships and expected to sell for £15,000, has sold for a whopping £384,000 in London, to an anonymous American buyer. The flag was presented by the 540 strong crew of HMS Spartiate to Fife-born Lieutenant James Clephan after the conflict, one of the few me to have risen through the ranks and highly admired by his crew. The presentation of the flag was considered to be one of the highest honours to be bestowed upon an officer by his men. Fancy transcribing Scottish school log books? The Family and Community Historical Research Society is looking for volunteer researchers from Scotland to help contribute to a UK wide school log book transcription project. The society is basically looking for people to transcribe such records as can be found in local archives for a database they are producing, which they hope will eventually go online. They offer a range of templates via Microsoft Access or Microsoft Excel, and there are a couple of videos on their site with further details. Military enthusiasts Scott Addington and Steve Habbishaw are embarking on a 580 mile long cycling marathon to raise money £10,000 for the Royal British Legion’s poppy appeal. The pair are cycling along the length of the Western Front trench system from the First World War, from the Franco/Swiss border to the Belgian coast, and aim to complete the task in time for Armistice Day on November 11th 2009. Whilst en route they will be keeping their sponsors appraised of progress via Twitter and their personal blog at www.worldwarone.wordpress.com. Along the way they will be wearing special designed cycling the line t-shirts, one of which was sent to the Queen at Buckingham Palace, with a good will message sent back in response. Anyone wishing to sponsor the pair’s efforts can donate online at www.justgiving.com/cyclingtheline. The A Vision of Britain Through Time website at www.visionofbritain.org.uk/census/index.jsp has a great deal of statistical census information online as extracted from each enumeration from 1801 to 1961, whilst the HistPop site at http://www.histpop.org/ohpr/servlet/Browse?path=Browse/Census%20(by%20date)&active=no&treestate=expand also contains information for Ireland prior to 1926 (the Irish census commenced in 1821). What I was not aware of, however, is that statistical census information for the Republic of Ireland, from 1926 to 1991, is also now available at the Central Statistics Office Ireland website at www.cso.ie/census/Census_1926_Results.htm. This is a story I missed whilst away on holiday, so thanks to architectural historian Jonathan Foyle for his tweet concerning it. According to an article in the Independent newspaper on October 7th, the New York based World Monuments Fund has expressed concern that five Edinburgh based cemeteries have deteriorated substantially because of exposure to the natural elements, vandalism and neglect. The sites are Greyfriars Kirkyard, Canongate Kirkyard, St Cuthbert's Kirkyard, Old Calton Burial Ground and New Calton Burial Ground. As a consequence the organisation has placed the cemeteries in the top 100 list of most endangered sites in the world. A large mural depicting the signing of the Declaration of Arbroath of 1320, which had previously been on display at the Abbeygate Shopping Centre in Arbroath, has been saved from destruction and given a new home at Arbroath train station. So long as but a hundred passengers remain alive, never will it on any condition be brought under the scrapyard's rule...! On Saturday 24 October 2009 we are opening our doors (9:00 to 16:00) for free introductory one-hour taster sessions in the Adam Dome, General Register House for new visitors to the ScotlandsPeople Centre. The Famous Scots exhibition in New Register House will also be open and it will be possible to visit our shop for gift ideas, books and other mementos. Please note, the other search rooms and café facility will be closed. We are making taster sessions available to people who are new to family history research. The one-hour session will be an ideal opportunity for you to become familiar with our digitised records and see how easy it is to start tracing your family tree. Please note, only one taster session per person will be permitted. The sessions will be held at the following times:- 09:30, 11:00, 12:30 and 14:00. We expect them to be very busy and on this occasion places can be booked in advance. To reserve a seat, please telephone 0131 314 4300 weekdays between 09:00 and 16:30. You can also book a place by sending an email to bookings@scotlandspeoplehub.gov.uk. General Register House is at the east end of Princes Street, opposite the Balmoral Hotel. The entrance to the Centre is behind the statue of the Duke of Wellington. The Famous Scots exhibition will be open between 09:00 and 16:00. This is a free exhibition in New Register House. Our latest celebrity is the Oscar-winning actress, Tilda Swinton. The Borders based Maxwell Ancestry company has launched its own blog at http://scottishgenealogyblog.blogspot.com, providing updates on its various census and transcription projects. Well worth a look. Forget Royal Mail - Ancestry also needs postal workers! Forget this week's postal strikes, Ancestry also needs postal workers - err, sort of! The British Postal Service has made its mark on over 370 years of history, often changing the way we live and work. It introduced the first mail coach, the first mail train - even the first deliveries by bicycle! Now we need your help to transcribe a set of important historical records - the British Postal Service Appointment books - and make them available to everyone online. The Ancestry World Archives Project lets anyone from the family history community help transcribe and so preserve these important historical records. The latest issue of Practical Family History magazine (Nov 2009, no.145) is now on sale, with loads of goodies on the inside, and three women trying to put out a fire on the outside...! This month there are articles on women at work during the war, free resources for family history research, Berkshire ancestors, how to create a time capsule, mourning quilts in North America, WW1 snipers, Jewish ancestry, the Western Front Association, the gold rush, Militia forces, and more, as well as all the usual regulars including the latest news from yours truly, incuding the latest news on PRONI's forthcoming closure in 2010 and more. Honestly, it's so great I could just crush a grape! £3.75 at all patriotic newsagents. Aerial photographs of Scotland from 1944 -1950 are some of the most recent map items to be put on our site. These RAF photographs provide detailed information on the landscape of post-war Scotland, as well as giving a fascinating portrayal of urban topography and land-use. You can search for OS air photo mosaics using a zoomable map of Scotland or by place-names. They are also available as a Google maps overlay, allowing direct comparison to present-day air photography and mapping. The new Highland Archive and Registration Centre in Inverness has been vandalised. Several of its windows have been smashed, with the damage caused estimated to be in the region of a four figure sum. The £10.5 million centre is due to open a week on Monday. For more on the story visit http://news.bbc.co.uk/1/hi/scotland/highlands_and_islands/8302275.stm . Learn how to get a readers' ticket, find your way around the Library and request materials from our collections. Find out how we can help you with your family history research. An introduction to Credo Reference and Oxford Reference Online. Learn how to access hundreds of quality reference books online. For more information, and to book a place, visit the NLS website at www.nls.uk/events/readers-workshops.html . The same workshops will be offered again in December. The British Library has today received a commitment of £33m from the Government to preserve and make accessible the world's greatest newspaper collection. The money was announced by the Prime Minister today as one of a number of capital projects for the cultural and creative industries. The British Library collects a copy of every local, regional and national newspaper published in the UK, plus 250 international titles. This unparalleled newspaper collection is an unique resource of over 750 million pages and is used for research by 30,000 people - genealogists, local historians and researchers from the creative industries - every year. The collection is used as source material for countless new books, newspapers, television programmes, films, documentaries, academic papers, local history projects and family trees in the UK every year, making a vital contribution to the UK economy. However the collection is currently housed in dilapidated conditions in Colindale in North London where 15% of the collection is already beyond use and 19% is in peril. The £33m investment will allow the collection to be moved to a state of the art storage facility in Yorkshire while allowing digital and microfilm access to the collection from the British Library's flagship building at St Pancras in London. Dame Lynne Brindley, Chief Executive of the British Library, said, "We welcome the commitment to the £33m investment to preserve and make accessible the world's greatest newspaper collection. This project will secure the collection's future and benefit the whole nation. It has the full support of the newspaper industry. "Our plans are already advanced with a number of key contractors already in place. We are 'shovel ready' and this commitment will allow us to start building in 2010." The British Library's plans have the full support of the newspaper industry, as the collection provides a valuable - and often the only - resource for a newspaper industry as it restructures its business in the digital environment. The Library is in discussions with the industry on innovative ways of working to provide online access following the success of its C19th newspapers online resource which was launched in partnership with publishers Gale, part of Cengage Learning, earlier this year. "I have been visiting the Newspaper Library at Colindale today and I am delighted that the Government has agreed to fund the British Library in its plan to save the nation's historic newspaper collection. "The collection is a most remarkable asset to the country and has in it an unrivalled richness and depth of interest to millions of people. "I look forward to working with the British Library on their future plans for digitisation to ensure that this importance resource is made available to more and more people." The excellent ScotFamTree forum is racing ahead against the competition when it comes to providing an interactive experience for family historians at all levels in Scotland. Not content with providing the most comprehensive discussion forum online, and an online television channel, they've only gone and launched a bloomin' blog! Good luck to Jock Tamson and the team - I've already signed up! Thanks to Evelyn at the ScotFamTree Forum for the following discovery - the Mitchell Library is closed today, apparently because of 'staffing problems'. Evelyn also notes 'phone ahead for the next few weeks if you plan to visit either on a Saturday or Mon-Thurs 5pm till 8pm cos they might well be closed: Tel 0141 2872910'. 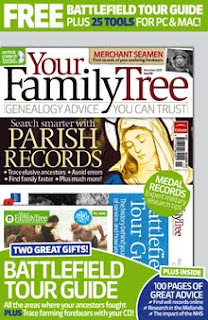 The latest Your Family Tree magazine is now on sale, full of all sorts of goodies. 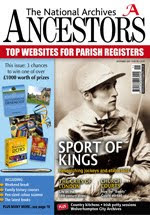 This month Paul Reed looks at medal records, Paul Rossi finds an ancestor with scarlet fever, Jim Dickson discusses a Napoleonic war veteran, Paul Blake investigates the records of merchant seamen, Neil Darby looks at the birth of the NHS, and yours truly provides the cover feature on how to search smarter with parish records, essentially tips on how to get the best from parish records across the British Isles, including tips on how to search the IGI better with Scottish records, and how to locate dissenter and Roman Catholic records. I've also contributed an opinion piece on the drawing to an end of Homecoming Scotland, where I put the point that successful as it was, this year from a family history point of view was really a celebration of thirty years and more of efforts by Scotland's family history community, which now has more to offer our distant cousins overseas than horrendous tartans and kilts when it comes to trying to establish one's real Scottish identity. There are also features on family history societies, aking free phone calls by internet va Skype, military records at Ancestry, wills and probate records, research in the West Midlands of England, expert Q&As, book reviews, and more, including the usual free data CD and a Battlefield Tour Guide. The latest issue of Ancestors (number 88, November 2009) is now on sale within the United Kingdom of Great Britain and Northern Ireland, with a tale or two to share...! Sarah Hutton looks at the Road Hill House murder of 1860, Stephen Wade examines English 'bawdy courts' , Michael Faraday looks at Hereford's Consistory Court, Fiona Fitzsimons investigates Irish petty sessions' order books, David Bishop visits Wolverhampton's archives, Karen Wicks looks at horseracing, Phil Wood discovers life in London, Roy and Lesley Adkins recall the great fire of Tyneside, and Ann Cliff argues that women were at the very heart of rural life in an article on the country kitchen. Ian Hartas looks at English and Welsh BMD records held in local registrars' offices, Simon Fowler discusses the forthcoming changes at the National Archives at Kew, and yours truly provides the latest internet news, including new Scottish and Irish resources. On sale now at £3.99. Pre-1841 Censuses and Population Listings in the British Isles. Colin R. Chapman. (1999). It has long been an article of faith that the census of 1841 was the first British census to list the names of individuals. This myth, as most of us know, has been exploded recently in a number of important publications but perhaps nowhere as comprehensively as in this cameo publication by Colin Chapman. In nearly 90 pages of text, accompanied by unique notes and references to original documents, Mr. Chapman describes hundreds of pre-1841 name lists (censuses, poll lists, national surveys, tax lists, parish enumerations, etc. ), explaining most of them, as far as possible, in their historical framework. He has interwoven simple enumerations of people, even surveys and numbers of houses, with detailed listings which furnish names, ages, addresses, occupations, religious affiliations, and more. Local unique lists are jumbled among national surveys, military with civilian, ecclesiastical with civil. As logic would dictate, the work follows a chronological pattern, and for this edition, the author has appended, in Appendix I, a county-by-county breakdown of the various censuses containing individuals' names with the dates of those censuses; and for completeness, in Appendix II, he has added a list of decennial censuses containing names of individuals from 1801 to 1831. This new fifth edition, completely rewritten, incorporates over 200 additional listings for Ireland, making it a unique chronological account of censuses and enumerations in the British Isles from 1086 to 1841. The strength of the book lies in the fact that the material is laid out chronologically, allowing you to gain an idea of the kinds of sources you could be targetting within your research at a given period. There is a county by county summary at the end, as well as a chronological listing, but for these, you would be much better advised to get a copy of Local Census Listings 1522-1930: Holdings in the British Isles (3rd edition) by Jeremy Gibson and Mervyn Medlycott, which has much better coverage for both Scotland and Ireland. However, based on a lecture as it is, Chapman's book is still very much worth reading. The pages can be downloaded from WVR, but it is quite a chore! After the free period, the book will then be accessible as part of a subscription package. To view the book, use the browse function. The University of Glasgow Library blog has a piece on the opening last night of a new Heritage Gallery at House of Fraser, Glasgow, as part of the company's 160th anniversary. The university's Archive Services holds the House of Fraser Archive, which it has been cataloguing for the last three years, and which will be launched online soon after current beta testing is complete. Canada's first prime minister, John A. MacDonald, is believed by many to have been born in 1820 at Glasgow's Brunswick Lane, a small street off Argyll Street in the city centre. If you had a look at the street today, you might not believe it. The abandoned buildings still standing there were most recently used as a pub and a brothel, and nothing stands there to commemorate the city's link to one of Canada's most famous adoptive sons. Matthew Hart has written an article in the Toronto Star concerning plans by the current owners, Selfridges (ironically owned by a Canadian), to demolish the last standing buildings on the street. In the piece he reveals the ongoing efforts to raise a commemorative monument in MacDonald's name. If you are planning to visit the ScotlandsPeople Centre in Edinburgh, please be advised that a major technical problem has led to a severely restricted service being implemented for the next few days, for those who have booked in advance only. In other words if you turn up looking for a seat, you will be in for a major disappointment. My understanding is that this is quite a big problem that may take a few days to sort - it is therefore advisable to contact the centre prior to any visit. The centre's website is at www.scotlandspeoplehub.gov.uk. An update on the situation is expected soon, and I will of course carry it as soon as it is announced. The Centre was closed on Thursday 15 and Friday 16 October 2009 due to technical problems, but will be open as usual on Monday 19 October. The 1911 Census will soon be made available via a dedicated subscription package at FindmyPast.com, from October 21st 2009. If you plan to view fewer than 10 households, it will be cheaper for you to continue using PayAsYouGo credits, but if you view more than 10 records, a subscription will be your best option. To meet customer demand, findmypast.com has made the 1911 census RG14 household forms available at the earliest opportunity. They’re in the process of adding the accompanying enumerators’ summary book (RG78) images but, because of the vast number of images, these aren’t available just yet. All the surviving RG78s will be available very soon. There’s a treat in store at Stirling Castle next week for fans of the hit BBC TV series A History of Scotland. The presenter, popular Scottish historian and archaeologist Neil Oliver, will be hosting a unique event to introduce his new book - also entitled A History of Scotland. - and talk about the making of the successful series which caught the imagination of millions of viewers by recounting the dramatic stories of our nation’s rich past. Historic Scotland, who worked with the BBC on the series in order to feature many of their properties in care, are providing an appropriate venue for the event. Stirling Castle’s stunning Great Hall is the venue at 7pm on Tuesday, 20th October for the joint Historic Scotland and Waterstone’s event at which Neil will talk about his new publication and the making of the authoritative TV series. The beautifully illustrated book uses the latest historical research and places Scotland’s story in the wider context of British, European and global history. Signed copies will be available for purchase during the evening. Tickets for the event, priced £5, are available from Waterstone’s Stirling shop at Unit 1, Thistle Marches or by calling 01786 478756. Neil, who was born in Ayr and is a graduate of Glasgow University’s prestigious Archaeology Department, first came to the attention of the public in 2002 in the BBC TV series Two Men in a Trench, which recounted tales of famous British battlefields. Since then he has impressed viewers in several hugely popular series - including Coast and Time Team in addition to A History of Scotland - and become established as a charismatic and passionate presenter whose love of history inspires in others interest and enthusiasm for his subject.